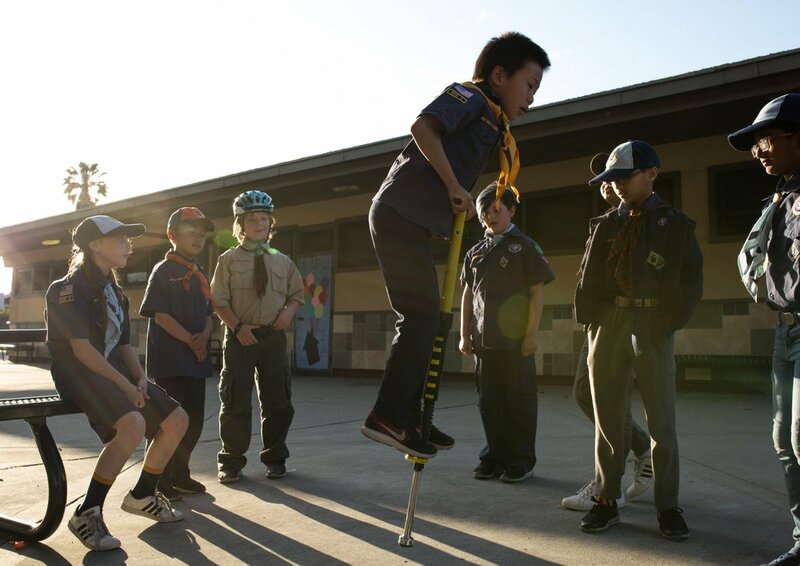 Paige, left, plays with her fellow Scouts before their Scouts BSA graduation ceremony in San Jose on May 16, 2018. Pack 317 was one of the first in California to integrate girls into their program following the rebranding of Boy Scouts to “Scouts BSA” last fall. Makayla Keating, 22, repeats her pre-show mantra as she prepares to take the stage for her first competitive pole performance at the Golden Gate Pole Championships in San Bruno. The Cal Marching Band prepares to take the stage at the Warriors NBA Championship Parade in Oakland. Darby Voeks, 22, scales cliffs without ropes above the sea, known as "deep water soloing", in Tonsai Bay, Thailand on March 23, 2017. A burned-out car rests in the driveway of what used to be the living room of a single family home in the Keswick area of Redding, one of the neighborhoods most devastated by September 2018’s Carr Fire. Supporters gather in San Francisco to celebrate Dianne Feinstein’s victory over Kevin de León, securing her senate seat in California for a sixth consecutive term in the 2018 Midterm Election on November 6, 2018. A shepherd tends to her cattle outside of the Pomak village of Kushla in Southern Bulgaria in June 2017. The Pomak people are a Muslim minority group of Slavic descent residing in Greece and Bulgaria since the fall of the Ottoman Empire. 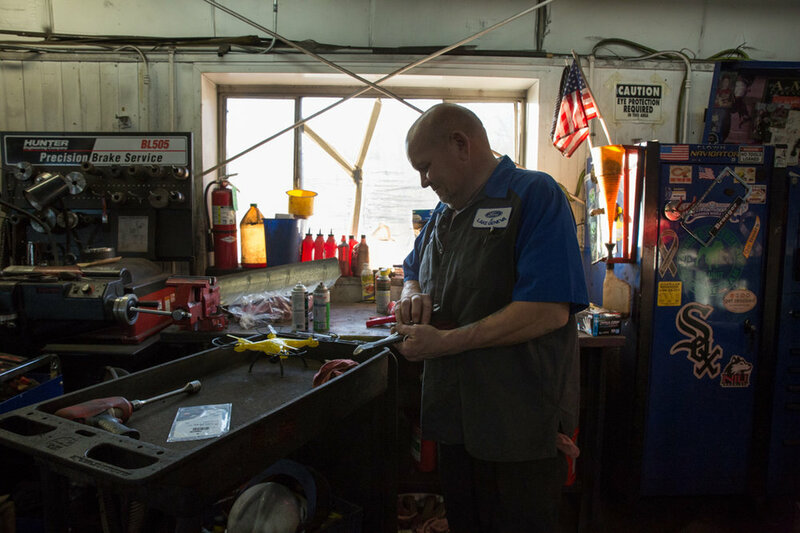 Rob, a master technician at a Ford dealership in Lake Geneva, Wisconsin, returns to the service department after a back surgery put him out of work for three months. Amelia Johnson, 27, center, cheers as a tour bus carrying Steph Curry, his wife, Ayesha, and their daughter, Riley, passes by at the 2018 Warriors Championship Parade in Oakland, CA on June 12, 2018. Pole dancers of all ages and abilities competed in the Golden Gate Pole Championships in February in San Bruno, California. Boys from the Pomak village of Myki, Greece roughhouse and set off firecrackers at a summer feast in June 2017, in celebration of the return of the village men from Germany, where they work to support their families instead of in Greece, where work is scarce due to the country’s ongoing economic turmoil. Yazan (left) and Amro Meqbil play in Beit Ummar, a village north of Bethlehem in the Israeli-controlled Area C of the West Bank. The Meqbils live in in constant fear of losing their home due to encroaching Jewish settlements. Residents of Redding participate in a Mud Run at Nash’s Farm to support Carr Fire victims and community rebuild efforts on September 22, 2018. 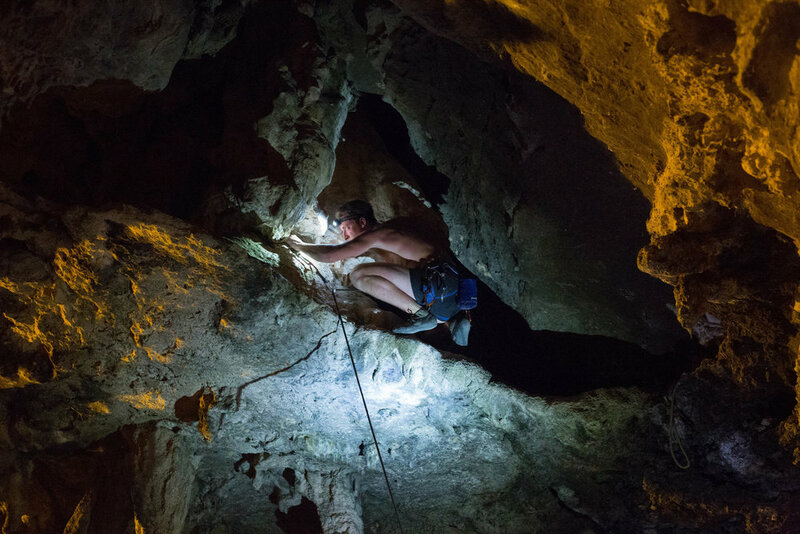 Climbers use headlamps to guide their way across narrow ledges and caves after sundown on Tonsai Beach in Thailand. March 2017. Palestinians pray outside Lion’s Gate in Jerusalem’s Old City in protest of Israeli Prime Minister Netanayu’s decision to place metal detectors at the gates of the Temple Mount in response to the shooting of two Israeli soldiers at the holy site in July 2017.